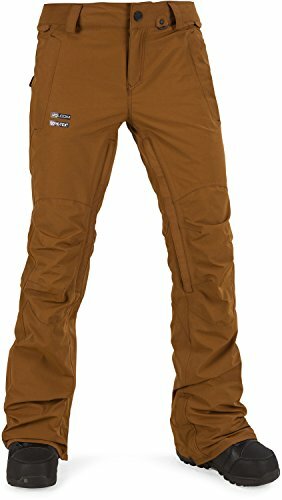 A versatile, riding style pant that's perfect for warm days on the slopes or layering up when the temperature starts to drop. Modern Slim fit is extra narrow at the knees & slimmer up through the thighs. ShellV-Science GORE-TEX® 2-Layer Laminate Shell is a softer, more breathable, and durable lightweight water/wind-proof fabric. InsulationShell warmth rated:• Simple, versatile, and perfect for layering. V-Science Breathable Lining System. Volcom Zip Tech® system keeps the snow out by letting you zip your jacket to your pants. Adjustable inner waistband. Specialty ticket ring. Stone patch in back. Triple reinforced rise. Brushed Tricot lined handwarmer pockets. Mesh lined inner thigh zip vents. V-Science boot gusset with snap. Stretch boot gaiter with lace hook. Black-flax reinforced back hem. Branding on right leg. 100% nylon;Lining: 100% polyester. Machine wash, tumble dry. Imported. Measurements: Waist Measurement: 30 in Outseam: 42 in Inseam: 32 in Front Rise: 9 in Back Rise: 15 in Leg Opening: 20 in Product measurements were taken using size SM (US 3-5). Please note that measurements may vary by size. A versatile, riding style pant that's perfect for warm days on the slopes or layering up when the temperature starts to drop. Modern Slim fit is extra narrow at the knees & slimmer up through the thighs. ShellV-Science GORE-TEX® 2-Layer Laminate Shell is a softer, more breathable, and durable lightweight water/wind-proof fabric. InsulationShell warmth rated:• Simple, versatile, and perfect for layering.